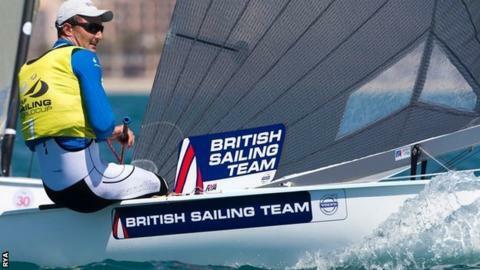 Giles Scott defended his Finn title at the World Cup in Mallorca as Britain's sailors also won four bronze medals. Scott, 26, remains unbeaten since his full-time return to the Olympic class after a stint in the America's Cup. Olympic silver medallists Hannah Mills and Saskia Clark were third in the 470, while Chloe Martin claimed her first podium finish in the laser radial. Charlotte Dobson and Sophie Ainsworth won 49erFX bronze; Dylan Fletcher and Alain Sign did likewise in the 49er. Scott picked up two yellow-flag penalties for illegally rocking his boat on the downwind legs of the 10-boat final, following a strong start over rival Thomas le Breton. "I got a good start, which enabled me to be on top of him," said Scott. "I ended the race a little frustrated, to be honest. I picked up two yellow flags, which of course I thought were unfair, but I would."